Earl's AN Swivel-Seal Direct Connect Hose End Fittings are made from premium aluminum alloys that meet or exceed aerospace specifications. They have dual plane anti-seepage seals and stainless retention pins that adjust 360° after installation. These handy fittings allow direct connection from AN hose to components with NPT, O-ring AN port, or metric threads. Don't settle for substandard imitations... the Swivel-Seal brand is the most reliable and widely sold premium hose end on the market. The design has been aerospace proven for over 55 years & used by Earl's in competition for over 30 years! 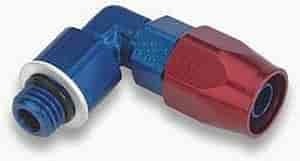 Note: Swivel-Seal Direct Connect Hose Ends are designed for use with Earl's Perform-O-Flex, Pro-Lite 350, Pro-Lite Ultra, and Auto-Flex Hose.